The original RXF36 fork had great reviews about the fantastic big hit control and class-leading chassis performance, but with some inconsistent feedback about small or medium impacts, with a number of people finding the fork overdamped, we wanted a more sensitive fork. What is the answer? Well, we could sell you a new fork with new decals and flashy new colours, talk about the all-new, best-ever modifications that take your stoke level to 10 even on your worse ride. That is not the Ohlins way. Maybe it’s the obsessive engineer in us that is constantly looking for improvements or just our commitment to our customers that we try and make every improvement retro-fitable into their current product. Having class-leading chassis performance and fantastic big hit control is a great foundation, but we felt that we needed to address some of the comments. Good is not something we strive for; our downhill mule fork was a double World Champion and we didn’t even release it, why? Because we could make it better. When our first MTB product was the now legendary TTX22m coil shock, it’s a tough act to follow, but with an infinitely adjustable air spring and a TTX damper controlling it, why can’t you please all the people all the time? The RXF36 Evo concept was formed. The original RXF36 goal was to create a world-class Enduro race fork. Carrying speed and having support and control in corners and steep sections were top priorities, comfort was further down the priority list. 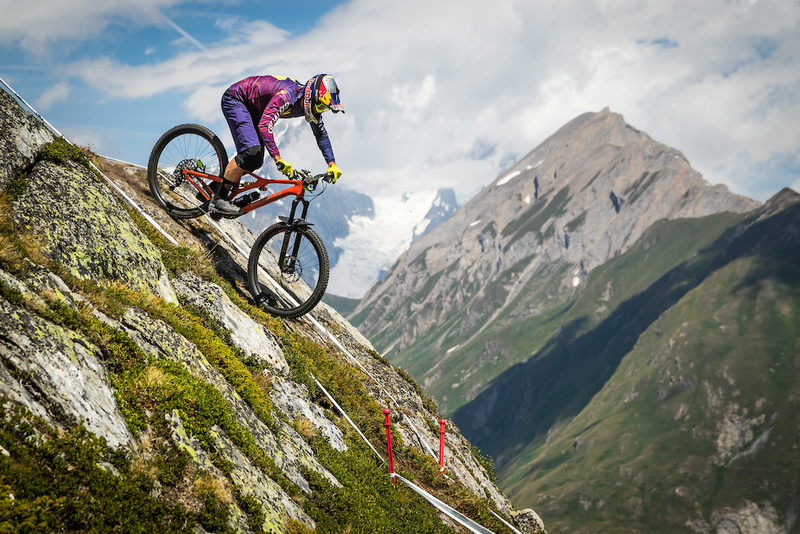 Not every ride is an Enduro World Series race so we changed the pace a little. 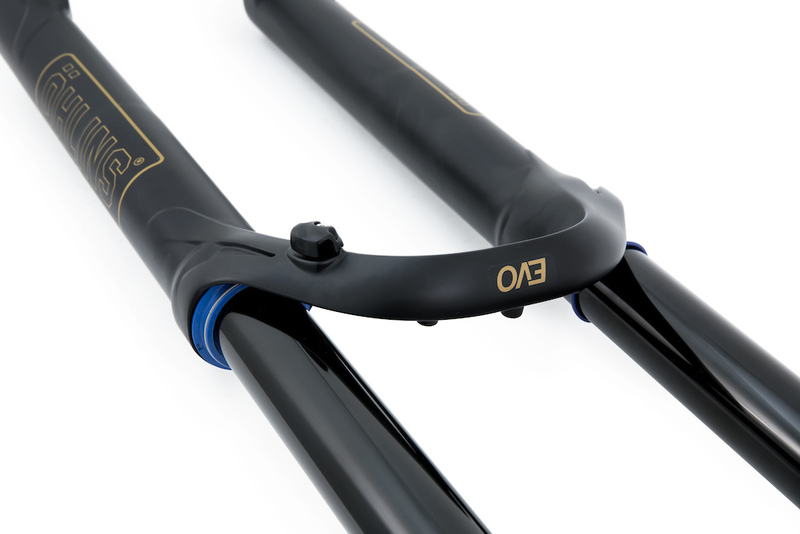 The Evo fork is forgiving enough to roll over that one root, that one that lies waiting patiently, ready stop all forward motion. When your arms are on the bars and you are completely cooked but are still focused on getting to the top for that one last lap. At the top, when you have sucked the last droplets out of your water bottle, hopelessly tried to eat the remains of the energy bar even though you have the worse cottonmouth in history, this is the fork, the fork that deep down, inside its TTX belly, remembers it was born a racer and helps you set that Strava segment on fire. The R&D group split the fork down to its 3 major components addressed each down to component level separately: Chassis, Spring and Damper. Each and every change affects all components in the system so it was clear that we didn’t want to lose any of the support and control we started with. 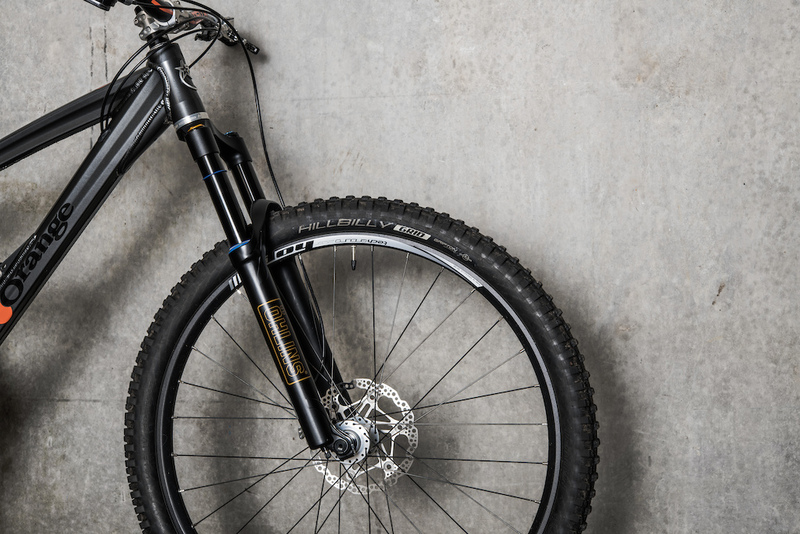 The original RXF36 fork chassis was already a star performer in stiffness and tracking. 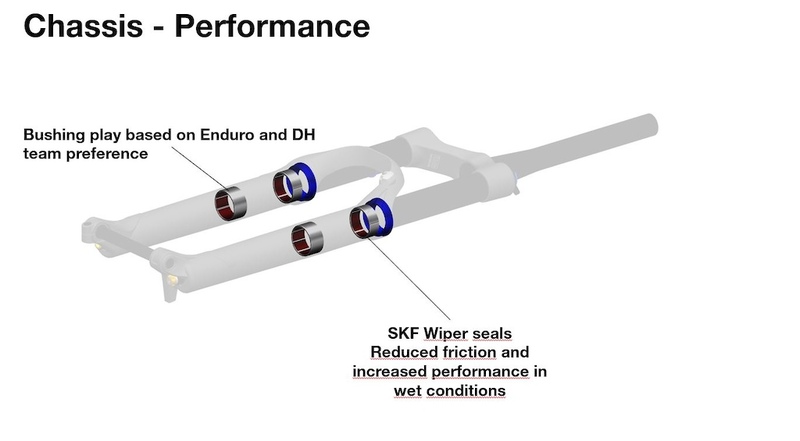 SKF seals had been proven to have better initial performance and better wet weather performance during our DH fork development process and also sealed against the superfine summer moon dust that you find in Whistler and Kamloops and all those other places we long to ride in the dead of winter. 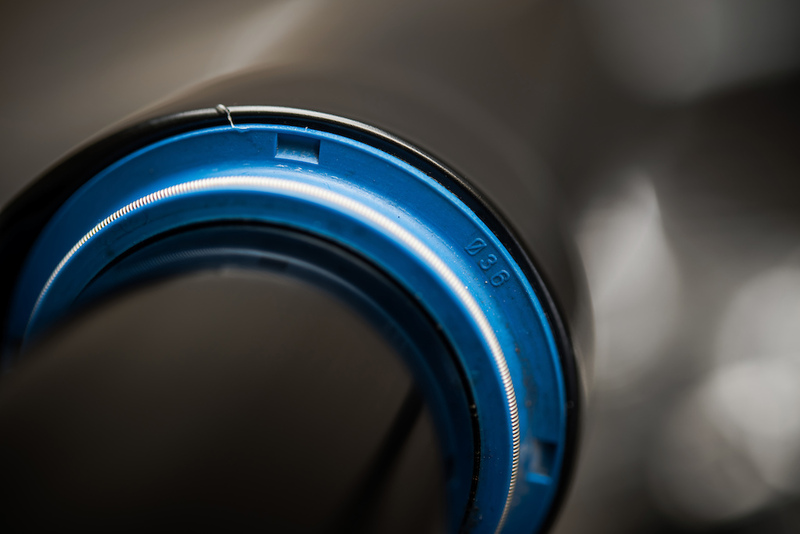 Bushings are always a compromise, and what works for us in motorcycles, unfortunately, can’t work in mountain bikes. 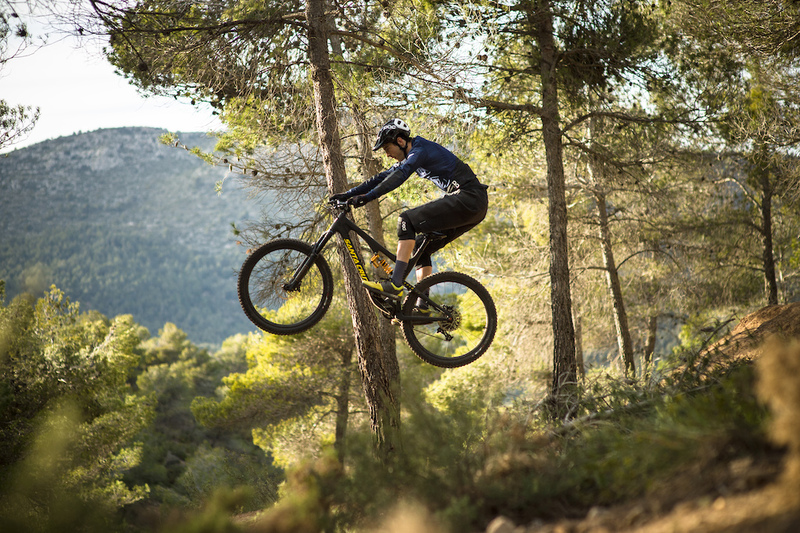 Motorbikes have a lot of moving parts that cause vibrations and noises meaning the play between the bushing and legs is not felt, but on a mountain bike any vibration and noise is much more apparent. Too much play and you feel a knock, too little play and friction levels build up which can lead to premature wear on stanchion tubes. 0.01mm or 1/10 the thickness of a sheet of paper makes a difference. All the Evo forks use the same freeplay as the forks our EWS and UCI WC racers used throughout 2018. A 30% increased negative volume in the air spring gives a noticeable change in small bump sensitivity, increasing mid stroke support and pop without increasing air pressure to the point where we lose durability and performance from excessive pressure on seals. Bigger is not always better with negative air springs. 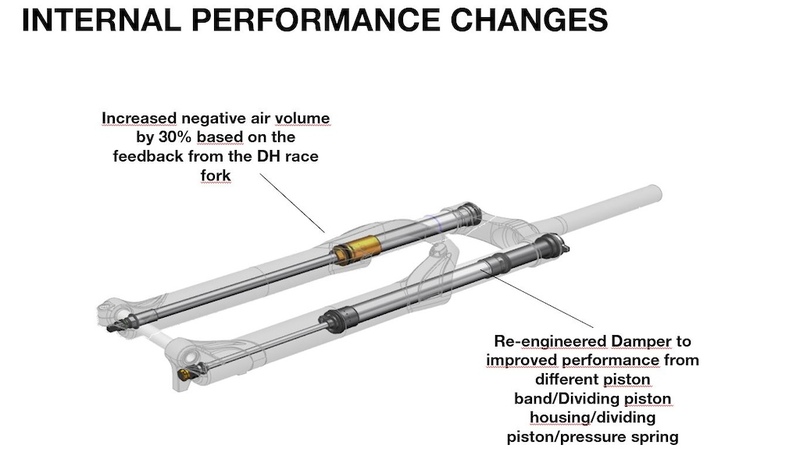 Breakaway force has been reduced by 50%, thanks to a main piston ring design and material change, which also allowed for a reduction in pressure build up at higher shaft speeds. Rebound forces were reduced by 10N and comes with the bragging rights that you went that little bit more moto. The reservoir housing now features a purge port to maintain optimum pressure on the oil throughout its service life. The dividing piston design was changed from cup to stud design to reduce friction and twisting of both the piston and spring against the shaft and housing. 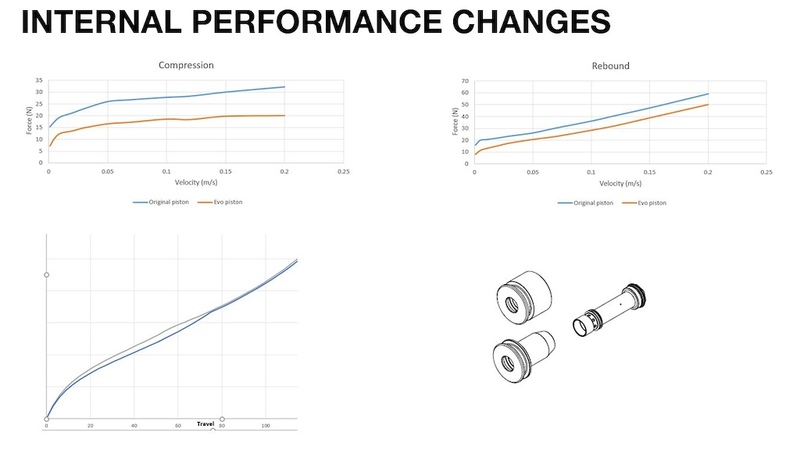 Pressure spring changes in material/stroke to help eliminate any ‘banana’ effect that could lead to unwanted contact with the housing and noise to improve durability. What this adds up to is improved feeling and sensitivity whilst retaining the big bump performance and class-leading chassis stiffness. The performance, stability and durability benefits are validated not only via the dyno rooms and laboratories but by differences the rider can feel. Price remains the same as the original RXF36 at 1100 USD/1035 Euro plus tax. All travel and wheel configurations. Existing riders can get all stages of the evolution, as all are retro-fittable into all our current forks. 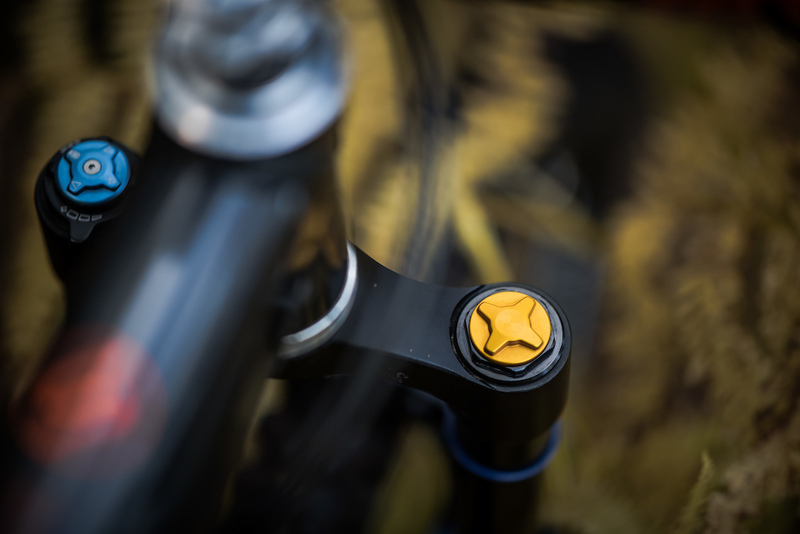 As with all our products, all riders can take advantage of our Performance set up program allowing custom damping settings right out the box.